History: (Wha...Huh?/10 (fb)) - Instead of Ben Grimm, former President Andrew Jackson accompanied Reed Richards, Sue Storm, and Johnny Storm into space, where the latter three gained superhuman powers. (Wha...Huh?/10 (fb)) - The foursome decided to use their powers for good, forming the Fantastic Four and battling the Mole Man, where President Jackson informed Mole Man that he was the first president to be nominated by a national convention and the first to use the pocket veto to kill a congressional bill. (Wha...Huh?/10 (fb)) - During a battle with Doctor Doom, President Jackson elaborated on his story about the pocket veto, explaining to Doom that congress did not have the right to control the Bank of the United States and that the Bank did little but further the interests of the elite at the expense of the working man. (Wha...Huh?/10 (fb)) - While battling the Sub-Mariner, President Jackson punched Namor while ordering Namor not to heckle him about the Election of 1824 because despite Jackson's lack of electoral votes, the House of Representatives elected him to office with warm enthusiasm. (Wha...Huh?/10) - When Galactus threatened the Earth, President Jackson continued his story about the Election of 1824, yelling to Galactus that he actually received fifty-six percent of the popular vote in 1832, which was more than five times the achievements of Henry Clay and the Whigs. Comments: Created by Mark Millar and Jim Mahfood. 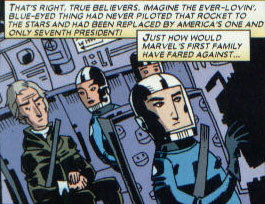 My guess for President Andrew Jackson being in the modern era was that Reed Richards more than likely discovered some sort of time travel device before traveling into space and that perhaps Reed thought Andrew a better pilot than Ben Grimm, given that the airplane wasn't even invented until 1900-1903 and Jackson appeared to have been plucked from around 1824. The divergent point for this Earth is Fantastic Four I#1 (November, 1961). The Mole Man was exactly the same as his Earth-616 counterpart, except that the word "stinky" was inscribed on his green costume, apparently because he smelled bad.